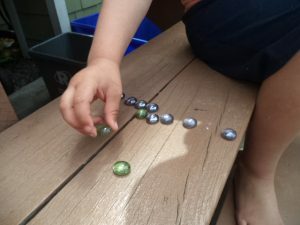 Flat glass marbles, like these in a grown-up friend’s fairy garden, inspired some fairy math fun and play counting, grouping, and making patterns. In the craft drawer, we have a few of these smooth, sparkly glass circles left-over from another project. They make wonderful fairy rocks. Big Brother, who is just 4, likes to count. He counted these several times. Each time he counted he got a different number, because he skipped a number here and there. Accurate counting comes from practice; just remembering all the numbers is quite a challenge, never mind getting them in the right order. He did touch each marble as he said a number, showing that he has figured out each number goes with one item. This one-to-one correspondence is the foundation for counting, that one number is connected to one thing. As we say more numbers, we mean more things. While he was counting, Big Brother noticed there were different colors. He liked the green ones so he separated them from the light purple ones. Making groups is a powerful thinking skill. As we think, we organize and deal with information. Do you remember the movie, “Honey, I Shrunk the Kids?” Grouping or categorizing is like the movie; it shrinks information into smaller packages. Making patterns is another way to shrink information. If the fairy rocks are in random order, it would be hard to remember the color of each one. If there is a pattern, such as purple rock – green rock, purple rock – green rock, it’s so much easier. 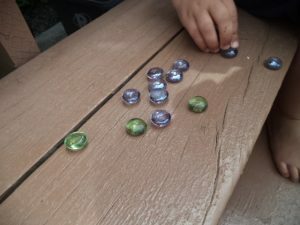 With the fairy rocks, I showed Big Brother a purple-green, purple-green pattern. He wasn’t interested in having a pattern. He just wanted the green ones. Again, patterning is a skill that kids develop from experience and practice. There will be other opportunities to show simple patterns until the brain makes the needed connections. For most of this fairy math fun, Big Brother directed the play as he wanted. He liked making a line and different shapes. After a while, he decided to do something different. 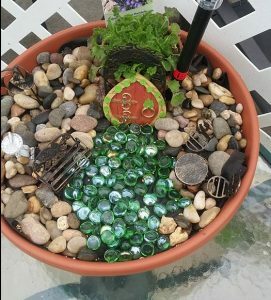 We carefully put the fairy rocks away so Little Brother didn’t get them. 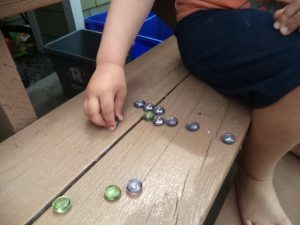 Do you have any items that could be fairy rocks for some math fun and play? For more fairy play activities, check the plays-of-the-day on the blog. Have you heard the expression it’s the little things that count? It’s also the simple things, like one-to-one matching for some dragon math fun. Sometimes, this is also called one-to-one correspondence. Surprisingly, math includes relationships. 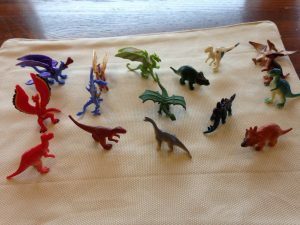 For this activity, we used some small plastic dragons along with some dinosaur friends. 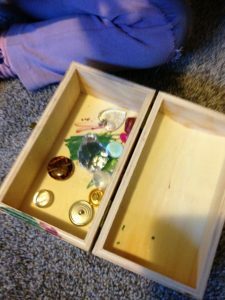 We had a container of treasure too, an assortment of flat marbles, play coins, buttons, and pretend jewels. To start the math fun, each dragon or dinosaur needed one treasure. Little Sister picked out just the right piece of treasure for each character. Obviously, this isn’t hard to do but it’s very important. The foundation of math is that each number means one item. Three is not just one number, it’s really three of them, as in 1 and 2 and 3. As we say each of those, it’s matched up with an object. This concept is something the brain needs to figure out and giving kids opportunities to match 1 number to 1 thing is helpful. Another way to have some 1 to 1 dragon math fun is to use an egg carton or muffin tin. Each space is like a dragon’s mail box or bank. Kids can put 1 bit of treasure in each space, but only one. They can walk a dragon (or dinosaur) over to get out the treasure. No dragon can have more than one. This activity is mostly for younger toddlers. Some older ones may have already made the brain connection for one number and one item. 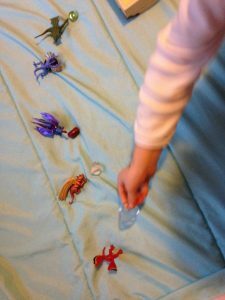 You can make the activity more challenging by having your child give two treasures to each dragon or dinosaur, or if there is enough, three pieces. This is the beginning of multiplication and it happened while playing. 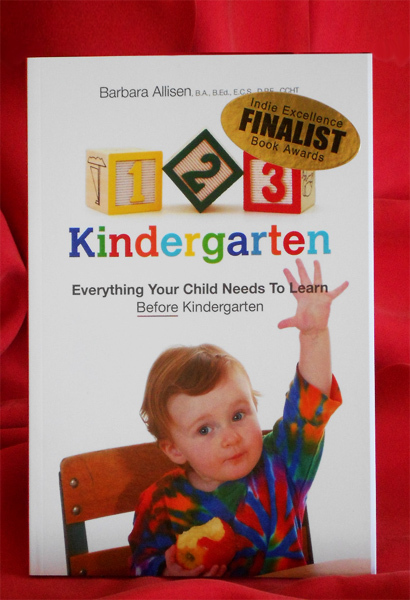 Playing with numbers and math gives your child a tremendous advantage. Have you ever wished you were more comfortable with math? We can make that happen for kids by including math play in their day. This was such a little and simple activity but it creates critical early math skills. 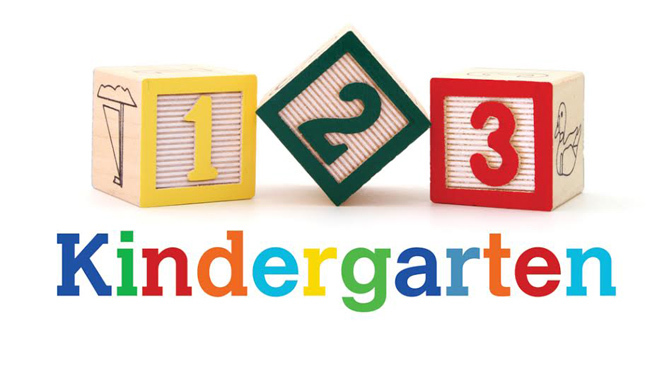 How do you support your child’s math play? Play is so amazing for learning. 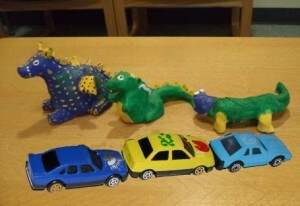 Play time with dinosaurs and cars was a great opportunity for figuring out one-to-one correspondence or matching. Besides counting and making a pattern sequence, this is another critical skill for math. Not only that, it’s important for language too. 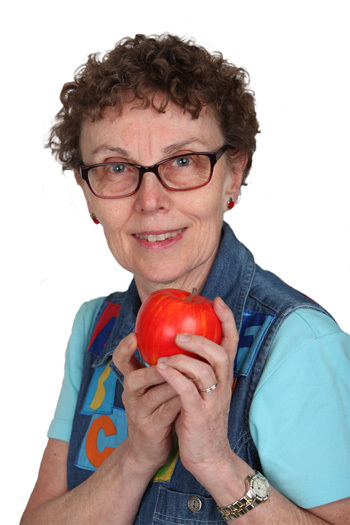 What is one-to-one correspondence? Just like it sounds, it’s matching one object to one other object. This is so obvious it seems like one of those times we could say ‘duh’ but it isn’t for young brains. Kids have to figure out that sometimes only one thing will go with one other thing. For instance, each number is one item and one word goes with one chunk of sound. With some cars altogether in a line, it was easy to put one dinosaur to one car. Each dinosaur could be paired with different toys too, such as blocks or Lego people. Kids can make their own matches. Sometimes, kids will do this on their own, or when it’s appropriate, adults can also put items together and show kids how each dinosaur gets one thing. Kids may or may not try one to one matching at this time but even a few minutes will give the brain something to think about. There are many opportunities in a day to practice this, such as one sock on one foot, each person at the table gets one plate, one kidlet per car seat, etc. The brain needs a great many of these to make the connection for one-to-one. It forms the basis for reading, one word and meaning goes to one squiggle bit. Think of how frequently we use it in a day. One person to one ticket on the bus According to R. Charlesworth and K. Lind, “One-to-one correspondence helps to solve difficulties….” It’s often the basis for social rules, such as one person at a time or everyone gets one turn first. . Now does it seem more important? Any one kidlet to one dinosaur in your child’s play?